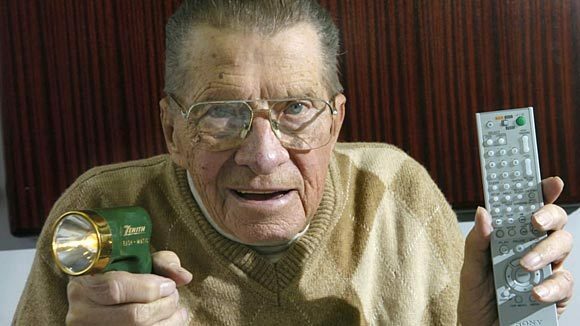 Eugene Polley, inventor of TV remote, died this past Sunday. Polley died of natural causes at a suburban Chicago hospital, said Zenith Electronics spokesman John Taylor. The former Zenith engineer was 96. I thought it was Doctor Who news-worthy to consider his passing since Polley took the idea of remote control from science-fiction to everyday fact. Though radio-remote control was also possible at the time, the idea of a hand-held device that could control other electronics was a breakthrough. 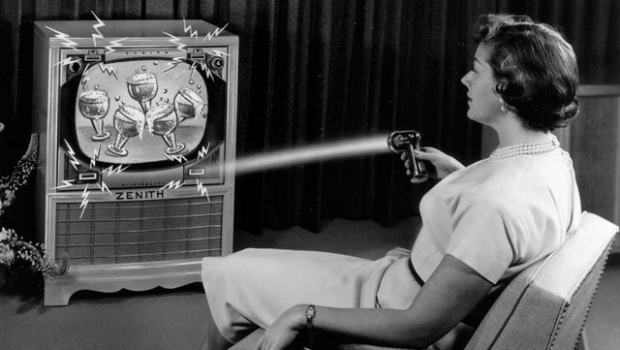 A sonic screwdriver in Doctor Who is a bit magic-wand, but thanks to devices like the TV-remote, it also became something plausible to TV audiences in 1963. 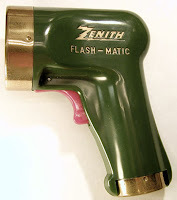 As an engineer for Zenith Electonics, Polley came up with the idea in 1955 for the "Flash-Matic", a green ray-gun looking remote that aimed at different corners of the tv set changed channels or volume up and down using photo-voltaic cell sensors. He also worked on worked on radar advances for the U.S. Department of Defense during World War II, the push-button radio for automobiles and on the development of the video disk, predecessor of today's DVD. Polley and fellow Zenith engineer Robert Adler were honored in 1997 with an Emmy for their work in pioneering TV remotes. In 2009, he received the Masaru Ibuka Consumer Electronics Award from the Institute of Electronic and Electrical Engineers.Over his career he earned 18 U.S. patents for engineering. Polley was proud of his invention even late in life, Zenith spokesman John Taylor said. He showed visitors at his assisted-living apartment his original Flash-Matic and how it had evolved into the technology of today. "He was a proud owner of a flat-screen TV and modern remote," said Taylor. "He always kept his original remote control with him." Now if he had only invented a device to help you find the TV remote I'd be impressed. How did we miss this story? Dark Day: What Do You Think Happened?